Hey, how are you? You know I really must say that it is great to be able to connect with you this way. I sense it and I appreciate it. I’m digging the vibe that we’ve got going. Thanks for sharing the flow. It’s a big number isn’t it? Do you know what it represents? It represents something that’s all around you everyday. It represents something that’s surrounding you and flowing through you and between you. It’s true at home, it’s true at work, it’s true in your car. And you know what, that number is getting bigger all the time. Every year the atmosphere gets more densely packed with it. What is it? There’s so much, but we ignore it. We don’t pay it any mind. It just is. We can’t see it, it’s just too tiny. Do you know what it is? If you ask people if they believe in this thing they will almost always say yes. In fact I know of no-one in my world that would deny its existence. We know about these things and we accept them. They have become our fractal of truth and our truths are aligned about them. They exist and they are real. What is it I am talking about? You thought I was going to say tachyons didn’t you? And you’d be right. But you’d be wrong. I mean sure they are tachyons, because tachyons are everywhere, but this thing I’m talking about specifically is the humble byte. Global mobile data traffic grew 81 percent in 2013. Global mobile data traffic reached 1.5 exabytes per month at the end of 2013, up from 820 petabytes per month at the end of 2012. Last year’s mobile data traffic was nearly 18 times the size of the entire global Internet in 2000. One exabyte of traffic traversed the global Internet in 2000, and in 2013 mobile networks carried nearly 18 exabytes of traffic. The full article from Cisco can be found here. You accept these bytes into your phone. You send these bytes from your phone. They float around you and through you everywhere you go. You know they are there and you use them to live your life, to connect, to communicate. There is no question in your mind of their existence. Did you notice how fast these things are multiplying by? In 2013 there were 81% more data bytes floating around you and through you in a rush to get to the device they’ve been sent or called to. If the growth rate stays the same that means by 2017 there will be around 200 exabytes of traffic whizzing around and through us everywhere we go. To illustrate, check out this image. It’s an artists impression of satellites currently orbiting Earth. All of them are pinging back data bytes in some form or another. So let me ask the obvious question. If you believe that the data byte is real, without question, are you willing to believe that the tachyon byte is real as well? If we are electric as I keep saying, then is it so much of a leap of logic to then think of tachyons as data bytes of sorts? They are a bit small to visualize I grant you, but if we are so willing to believe in the invisible wi-fi byte, why not the invisible tachyon byte? So are we good so far? Still with me? You are so awesome, thank you. OK so this is the key element for today that I’d like you to consider, data bytes are everywhere, data bytes are actually tachyons when we strip them back to their bare essence. However, data bytes (ie tachyons) can be coded with information in two different ways, did you realize that? Remember as I’ve always said, we live in a Duality, so there are always two elements to things, the same goes for data. It is the clarification that there are two ways of coding data into the tachyon that makes me call it the Duality of Data. This information is nothing new, it’s always been around. However as technological advancement takes us in leaps & bounds into the future we just happen to be interacting with one of the two types of data much more regularly then ever before. That big number at the top of the post proves it. So what are those two data types I hear you ask? Well one of them is represented by the humble data byte that passes through you on the way to your phone as you receive that text message. This data type is quite obviously known as binary data. That makes sense doesn’t it? The category of binary data is real and we believe in it as I mentioned earlier. For the sake of simplicity for the moment I shall call the other type of data, non-binary. It’s a bit vague I know, but stick around, I’ll explain it further. So we have 2 data types, binary and non-binary. I guess I could call them Data Type a) & b). Or maybe Team blue & Team red. Any two names would be fine I guess. But for my purposes I like to think of these two types of data as the Square and the Circle. Why? Because binary (square) data is much more structured. It follows strict rules of coding and transmission. It travels in straight lines if you like, just like the edges of a square. Just like this representation of 64 bit data. Non-binary (circle) data is different, it has far less structure, it flows differently, like water it avoids straight lines. That’s why I call it circle data. 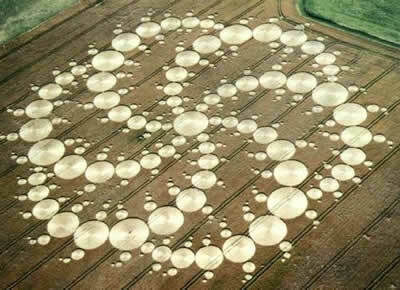 Think about it a bit like this image a a crop circle. The data flows in a circular spiral motion. So the take out for today. We believe in the wi-fi transmitted, binary coded (square) data byte, there is no question about our belief in that. In fact if you’ve downloaded this via wi-fi the binary coded tachyons that went into making up this post probably passed through you on the way to your device before you read this. If you’re like me you interact with the humble binary coded (square) data byte everyday through texts, videos, email, photo’s, music, blogs, books, apps…..this list grows everyday. It’s pretty hard to deny their existence and it’s getting harder and harder to be somewhere that they are not. Binary data is very structured. The information is coded within the specific rules of binary, zero’s and one’s, on and off, black and white. That is why I call the binary coded byte square data. But what about the non-binary data bytes? What about circle data? What is that? How do those data bytes work? Are they just as real as the binary type? Can we use them in our technology? How can an understanding of non-binary data enhance our lives just as our understanding of binary data has done? I am humbled once more by your support. Thank you for reading. One amazing post . And you have just conveyed the details so perfectly . I think every single person should read this . Thank you so much for feeding my brain today.